A new and virulent pain epidemic known as Wall Street Pain is amongst us; It’s scary. If you Google it there are over 9 million entries so it clearly an international epidemic. Few have or will miss out. It seems to be closely associated with Financial Pain (2.3 million entries) and a new and growing allied problem called Mortgage Stress (400,000 entries). Some people may have contracted all three. The only good news is that a previous epidemic known as “Fuel Pain” (16 million entries) is thankfully waning. Like any pain problem, either personal or public it would be helpful if the sources could be found, thus blame apportioned. But with this Wall Street Pain, nobody is taking the blame and this will probably make it a lot harder to manage. Optimal pain management strategies will need to address this epidemic, but a framework will be necessary. 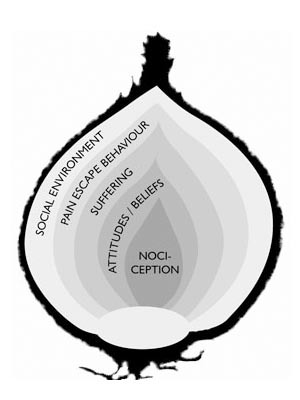 John Loeser and Gordon Waddell’s onion skin model, a key feature of the biopsychosocial approach may help (see figure). This figure from ‘Explain Pain’ which is a slight variant on the original model has each ring of the onion as a contribution to your overall pain construction. Note the outside ring called ‘social environment’. The events of 9/11 provide a graphic example. I recall a study, reported in many newspapers about its effect on the pain levels of US east coast chronic pain sufferers. More returned to pain clinics, more sought treatment. One hypothesis at the time was that it could have gone the other way and created less pain but this was wrong. However, good clinicians now had a powerful and rare opportunity to educate patients (and themselves) about how pain is not just something constructed from within (such as nociception – the innermost ring on the onion) but something which can be influenced by world events. Wall Street Pain (now WSP) is the same. Think of this next time you’re eating an onion! WSP does not exist in the ether. It biologises itself. This means that the new environment created by the epidemic enters the brain in the form of increased synaptic activity in key brain parts such as the anterior cingulate, amygdala, frontal lobe, hypothalamus and insula among many other parts. These areas are often active in pain, stress and depression states. This is not a nice epidemic, but forewarned is forearmed. Unfortunately there is no rapid cure. This is a slow process. I noted however, that financial planners are beginning to biologise it – one in Canada’s National Post calling it a ‘life’ event which triggers a review of financial plans. Financial planners could well help in pain management. We discuss paradigms like Onion Skins in ‘Explain Pain’. It may be very helpful for many people to know that world events can have physiological effects on their bodies, including pain production. The simple question of “what’s bugging you” may assist in the diagnosis of WSP. This educational experience of WSP may also provide a lifelong lesson to assist in coping with many other pains in future years. We are absolutely loving all that you send. So this time write to us, here in Adelaide and tell of your closest experience – personal or clinical – to ‘Wall Street Pain’. The winner will be sent an Explain Pain Audio and an Explain Pain book! Your thoughts on this topic are fantastic! Check them out, print them out – heck, sing them out aloud in the tune of another song! It may interest you that I recently saw a patient who we practiced mindfulness with. This patient had been involved in an RTA and had lost her right lower leg. She was keen to improve her walking with her prostheses. Whenever she attempted to walk her pain increased significantly. She tried hard to distract herself from her leg although this did not work. After assessment we looked at the workability of the distraction. We experimented with trying to distract from her leg (as hard as possible!) and she noticed it actually increased her sense of struggle, fraustration and her pain! We then practiced a series of mindfulness meditation practices which involved resisting the tendancy to change anything and instead be openly receptive to the actuality of her present moment experience. She noticed that her mind went off to the fraustration about not having a leg, how things should have been, worries about how things might be in the future, and thoughts about not being ‘good enough’. She reported that during this time she was less aware of her body overall, although was more aware of her pain! She then practiced a regular body scan which involves guiding the awareness through the body and ‘see what comes up’. Interestingly she reported less pain when she attended in detail to her right lower leg (which wasn’t there!). 1) when she was more in her head comparing and analyzing her situation she was less aware of her body yet more aware of pain. 2) When a non judgmental awareness was placed on her affected limb (in a balanced open way) her symptoms were less. Therefore we planned for her to walk with her awareness placed within her feet both sides (big toe, little toe and heel) and every time she noticed she was up in her head she was encouraged to label this ‘thinking, thinking’ and guide her awareness back to her feet and then to widen her awareness to include her body as a whole. Result: This increased her walking significantly and reduced her pain. Interestingly when ever she did it to decrease her pain it did not work (comparing mind perhaps?) however when ever it was performed out of a gentle curiosity and interest walking was better and pain was less! This entry was posted on December 7, 2010 at 4:27 am and is filed under 2008. You can follow any responses to this entry through the RSS 2.0 feed. You can leave a response, or trackback from your own site. if you do not move after a few minutes; then you will start to feeling uncomfortable in some parts of your body.